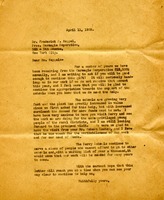 Addie Hickman writes to Martha Berry with the annual donation of 5 dollars and tells Martha Berry to address communications to her because the previous woman is unable to help them anymore. Martha Berry encourages Dr. Keppel to continue the Carnegie Corporation's annual gift to Berry because it will "seriously handicap" their work if they don't receive it. She gives an update on the growth of the schools. 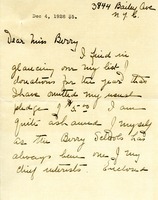 She also encourages Dr. Keppel to visit Berry. Miss Emily Kimball sends a $5.00 donation to the Berry Schools. 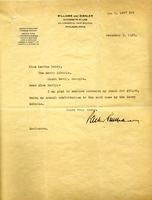 Letter to Martha Berry from a someone at Williams and Sinkler Attorneys at Law informing Miss Berry of his annual donation of $50.00 to the work at the Berry Schools. 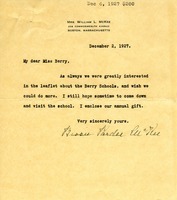 Mrs. McKee writes to Martha with their annual gift to the Berry schools.